The fossils of a bizarre marine reptile with a unique mouth have been discovered in south-western China. Although its body resembles other types of marine reptile, the skull and the mouth are extremely unusual and nothing like them has been seen before in the fossil record. A number of scientists have speculated about this strange anatomical arrangement, the upper jaw resembles a vertical slit with fine teeth arranged to form sieve-like structure. A prehistoric animal that has a “zipper” for an upper jaw. These adaptations indicate that this three-metre long sea creature evolved to fit a very specialist niche in the marine ecosystem of 245 million years ago. The animal has been named Atopodentatus unicus, the name translates from the Latin to mean “peculiar teeth of unique shape” and one glance at an illustration of this particular beastie shows why the nomenclature is so appropriate. This is one of those occasions when the interpretation of the fossil material and a resulting illustration needs to proceed any further discussion so that the reader can gain an impression of just how weird this animal was. The land that makes up the border between the south-western Chinese provinces of Guizhou and Yunnan is very important to palaeontologists as they try to reconstruct how life on Earth bounced back following the End Permian mass extinction. The rocks laid down in this region represent Early and Middle Triassic marine faunas, the fine sediments that were deposited at the bottom of a shallow, tropical sea have preserved a wealth of marine reptile fossils, along with fishes and a vast array of invertebrates. By recording the diversity of life preserved within this series, scientists can see how life on Earth recovered from the mass extinction event that marked the end of the Permian geological period. The Atopodentatus fossil material was found in Luoping County (Yunnan Province), the strata in this area has been dated to around 245 million years ago (Anisian faunal stage of the Middle Triassic), a little over five million years since the extinction event that saw an estimated 95% of life on the planet wiped out. At this time in the Triassic, a number of different types of marine reptile had evolved, all of which were descended from terrestrial ancestors. A large number of Ichthyosaur specimens have been discovered, some Ichthyosaurs co-existed with Atopodentatus but in younger Triassic rocks (Ladinian to Carnian faunal stages 230 to 225 million years ago), it seems that Ichthyosaurs had established themselves as the largest and most important marine reptile group. The other types of marine reptile that lived alongside Atopodentatus are almost as bizarre. There are primitive Sauropterygians, such as Nothosaurs and animals that are ancestors of the much more familiar Plesiosaurs and Pliosaurs, Protorosaurs, partially marine reptiles that were to give rise to the long-necked Tanystropheus and other peculiar Archosauriforms. It seems that this part of the world was a “melting pot” for marine reptile evolution with some groups, surviving into the Jurassic, with other types completely dying out within a few million years. These rocks have been explored and mapped for more than ten years, by an international team of scientists. The report on the strange Atopodentatus has been published in the academic journal “Naturwissenschaften”, the study into A. unicus was conducted by scientists from the Canadian Museum of Nature, the Wuhan Institute of Geology and Mineral Resources as well as the Chinese Academy of Sciences. Dr Xiao-Chun Wu (Canadian Museum of Nature) and his colleagues named the new prehistoric creature Atopodentatus unicus and suggest it belonged to a Superorder of reptiles called the Sauropterygians. Staff from Everything Dinosaur, having reviewed the fossil bones have suggested it might be a type of Nothosaur, but one with a very specialised feeding method. The body of the animal was quite long, the neck short and the skull much deeper than other similar sized Triassic marine creatures. Most Nothosaurs were fish-eaters, but the dentition and the morphology of the jaws suggest that this newly discovered reptile had a weak bite and teeth unsuitable for tackling struggling prey. On each side of the mouth, A. unicus had around 35 small, pointed teeth in the front of the upper jaw. There were around 140 similarly shaped teeth in the rest of the upper jaw, with at least 100 located in the horizontal portion with the remainder located in the vertical, zipper-like portion of the top jaw. There were nearly 200 teeth located in the lower jaw, over half of which were in the horizontal portion with the remainder located in the shovel-headed front part. All the teeth were covered in enamel, indicating even wear across all parts of the crown of the tooth, but the teeth do not look very worn, perhaps this hints at the sort of prey this animal specialised in catching. Whatever it was eating, it probably had this food resource all to itself amongst the vertebrates as no other creature found to date has anything approaching the jaw anatomy of this marine reptile. The picture shows the long, serpentine body of the reptile with the deep, shovel-shaped skull shown as an inset. Note the well developed limbs, particularly the large humerus. This prehistoric animal was probably only partially marine, still capable of venturing out onto land, although the broad wrist bones and elongated fingers and toes enabled the limbs to be used to help the animal swim. As to what this animal actually ate, no one knows for sure, there is nothing similar living today that seems to have anything remotely like its specialised feeding apparatus, or is there? The Bowhead Whale (Balaena mysticetus), has plates of baleen made from keratin in its mouth which it uses to sieve out planktonic organisms as it swims through Arctic waters. The mouth of Atopodentatus may have been adapted for sieving out small creatures but not from open water like the huge-mouthed Bowhead, but from soft mud on the sea floor. 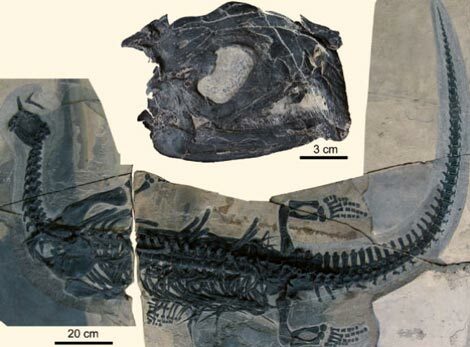 Dr. Wu and his colleagues, suggest that the broad, shovel-like head of this marine reptile may have ploughed through soft sediments with its teeth sieving out soft-bodied creatures such as marine worms. At the moment, the actual function of the jaws remain a mystery. Perhaps a specimen will be found with stomach contents preserved or perhaps some trace fossils will be discovered the reveal a ploughed up seabed. One of the few certainties surrounding this bizarre creature is that like a number of the strange marine reptiles that existed in the Mid Triassic seas of China, within a few million years this particular branch of the marine family tree had become extinct.